LG has released a video that showcases all the cool new features that users will get with the value pack update on their Optimus G Pro. Smart Video: Smart Video recognises the position of the viewer’s eyes and automatically plays and stops the video. This is a feature that we have already seen in the Samsung Galaxy SIII. Dual Camera: Captures a picture of both the subject and the shooter at the same time. Pause and resume recording: allows users to pause and start in record mode for one continuous video file. Magic Remote Pad: lets you use your smartphone to control your LG TV. The above-mentioned features aren’t revolutionary and we have seen them on other smartphones before. Samsung has given users access to these features on their Galaxy and Note series of high-end smartphones in the past. It is these little features that help distinguish one Android smartphone from another and it is nice to see LG finally catching up. 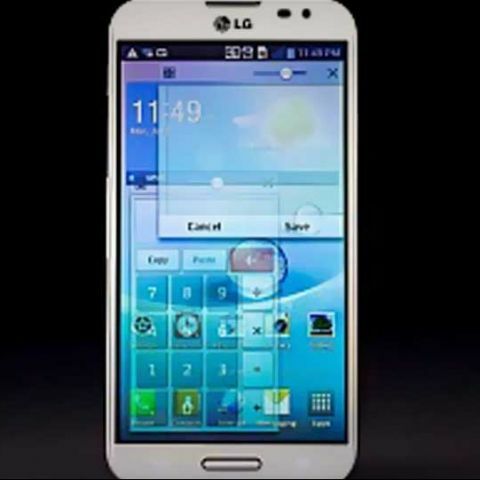 There is no information on when these features will appear on the globally launched LG Optimus G Pro’s. There is also no information available whether these features will make an appearance on any of the other high end LG smartphones. The LG Optimus G Pro boasts of a 5.5-inch full HD display, is 9.4mm thin and weighs 172 grams. It has the Qualcomm APQ8064T Snapdragon 600 Quad-core 1.7 GHz Krait 300 CPU along with 2GB of RAM and the Adreno 320 GPU. The rear houses a 13MP camera and the front has a 2.1MP camera. The smartphone has a 3140mAh battery. LG has released a video showcasing the new features LG Optimus G Pro users willl get with the update. You can enjoy the video below. Is Digiflip Pro has calling features or not?